It's that time again at Lush, my favorite bath/shower place of all time. 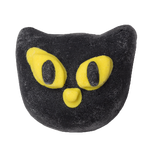 Halloween is my favorite time on Lush's website, because they always come up with such spooky fun bath products. My kids love Lush, it makes bath time fun for them. Although I try to explain, you can't put the WHOLE bath balm in the water, they are EXPENSIVE! Ha! Anyways, here are some of this year's scarrriest bath goodies. is a fruity lime and neroli perfume that is guaranteed to make your bath a beautiful bright pink. 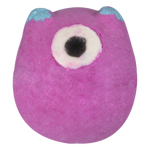 This one is more cute then spooky, and I almost wish it had 2 eyes, because it isn't very scary to me. But it does smell amazing, and this is my top pick for Lush's Halloween goodies this year. 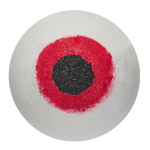 Now this is a little more spooky, it does look like a real bloody red eyeball. This is a blend of lavender, rose & ylang ylang oils. But be careful, it may be wattttccching you! 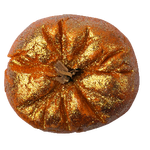 A sparkly pumpkin reminds me more of Thanksgiving, and not really Halloween, but the colors and glitter just make this a gorgeous decoration, until you soak it in your bath. Juniper Berry, lime and grapefruit oil making this one probably my favorite smelling one of out the haul. I love when Lush adds sparkle to their bath balms. This is a much better decoration piece then in the bath; it also makes your bathroom smell great. A spooky black cat makes any Halloween the perfect fright night, and if you're wondering what the scent is on this bath balm, it's a cloud of fruity bubbles that will make your bath absolute perfection with dark mysterious waters. This one my kids WON'T do because they don't like to get in a bath full of BLACK water, so this one went to waste a little. I'm sure of the exact notes in the fragrance, but it's fruity and clean smelling. 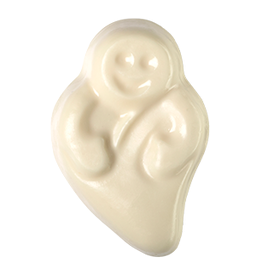 This spooky ghoul is a Citrus-sweet lemongrass covered in organic cocoa butter butter, meant to keep the moisture locked on your skin all day long. Another great decoration piece, this is a soap that will scare away all dirt and oil and of course dryness ! (I got that line from the Lush website, I couldn't help but include it) This ghost looks more friendly then scary though, with a big silly smile. Who could be scared of such a cute little ghost? If you enjoy this one, it also comes in a Jelly Bomb & a Solid Perfume. Personally I like the slime green color. That is the part that makes it so intriguing to me, plus the scents are a Ghostly Grapefruit and a terrifying tangerine. I think I MUST get the perfume version of this, because I don't think this one will stick around past Halloween, and the Lush perfumes usually come and go with the season. But if you're unsure if this is for you, try the bath balm or the shower cream and I guarantee this will be a hit in your household. This makes the perfect gift if you know someone who has a birthday around Halloween, or you just want to make someone happy, this is an amazing present. Monsters Ball, Ectoplasm Jelly Bomb & 2 headed Knot Wrap make this a trio of bathtime perfection. This is just the perfect gift that says, "I love you" and I want you to smell GREAT this Halloween. 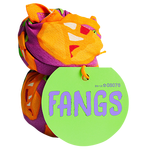 Fangs - Wrapped Gift ($11.95) An eyeball bath balm wrapped in Fangs knot wrap is just a little gift to tell someone Happy Halloween this year. All it is is a bath balm wrapped in cute Lush paper, so it's nothing too special, but it just lets someone know you're thinking of them this Halloween. 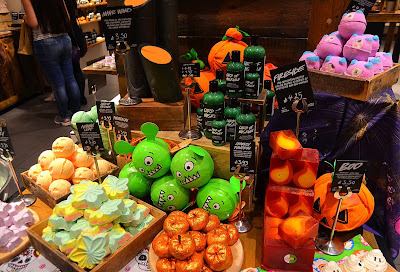 Overall, I'm impressed with the lineup from Lush this Halloween. My favorite pick is the Ectoplasm Shower Gel/Perfume, because the scent is my absolute favorite, Grapefruit. So if you're only going to buy one thing from the collection this year, I would peep that for sure. If you're looking for a bath balm I would go with Monster's Ball, but I am a "fruity" scent person, if you love the flower smell Lush brings- the Eyeball is my top pick. And if you're unsure about it all, just check their website.